A new era of control. 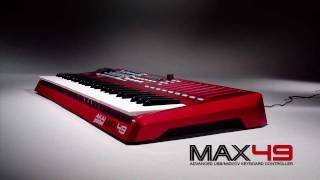 MAX49 from Akai Professional places revolutionary MIDI and CV control at your fingertips. With an intuitive layout and included AkaiConnect automatic-mapping software, MAX49 offers an instant, fully immersive experience with your favorite music software and virtually all VST plugins. From its 49 semi-weighted keys and 12 real MPC pads, to its groundbreaking LED touch faders and vintage CV & Gate outputs, MAX49 combines cutting-edge Akai Pro technology with classic capability to give you an unprecedented music-making experience. MAX49 is one of the most unique controllers ever engineered. Right away you'll notice one of its most distinguishing features: four banks of eight backlit LED touch faders, allowing you to assign up to 32 control parameters. You can use MAX49's LED touch faders just like analog faders by simply dragging your finger along their touch strips, or you can perform instant leaps in any MIDI value from zero to maxed out and everything in between—an unprecedented, unmatched controller capability. MAX49 is also equipped with four banks of 12 backlit MPC pads, giving you a total of 48 assignable pads, allowing you to integrate legendary Akai Pro production capability into live performances and recording sessions alike. These backlit, velocity sensitive pads come with classic MPC Swing, Note Repeat, Full Level and navigation controls to give you all the tools you need to create music at your highest level. MAX49 comes ready to command any controller hardware or software from any era: USB MIDI, traditional 5-pin DIN MIDI and even Control Voltage and Gate outputs are onboard, allowing you to control everything from today's most advanced music software, to analog modular synths from as far back as the 1960s. Mackie Control and HUI protocols are also built in to give you instant compatibility with many industry standard DAWs. When you're ready to get down to business, MAX49 delivers essential controller features with excellence. 49 semi-weighted keys with Aftertouch are laid out before you, providing professional feel, perfect response and full musical expression. Large, centrally positioned transport controls give you straightforward track navigation, and rubberized pitch and modulation wheels provide for instant creative flourishes. MAX49's expanded arpeggiator includes a Latch button as well as eight different time divisions to create sweeping and endlessly varied melodic cascades. A built-in step sequencer allows you to get the music in your head laid down with exacting detail. MAX49 comes with AkaiConnect automatic-mapping software, so you'll be up and running in your favorite DAW and VSTs in seconds. AkaiConnect has been designed to eliminate the guesswork and give you more time creating and less time setting up controls. Instantly assign MAX49's knobs, MPC pads, touch faders and buttons to your favorite music software plug-ins by simply clicking on the software element you want to control, then touching the knob, pad, fader or button on Max49. Cutting-edge, classic and complete control: MAX49. Get ready to experience one of the most dynamic and unique performance controllers ever created. Considering purchasing the Akai MAX49? Have questions? Ask people who've recently bought one. Do you own the Akai MAX49? Why not write a review based on your experience with it. 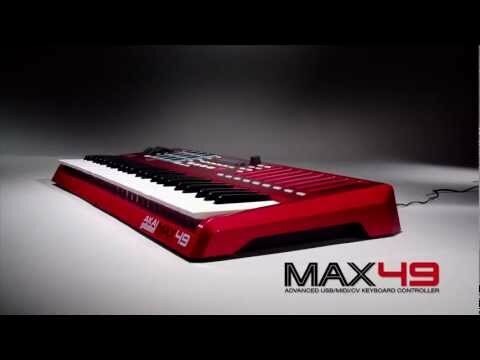 Seen a video for Akai MAX49 online or have you own video? Check out Akai MAX49 on DJkit.com!